Please check your credit card balance before making payments. 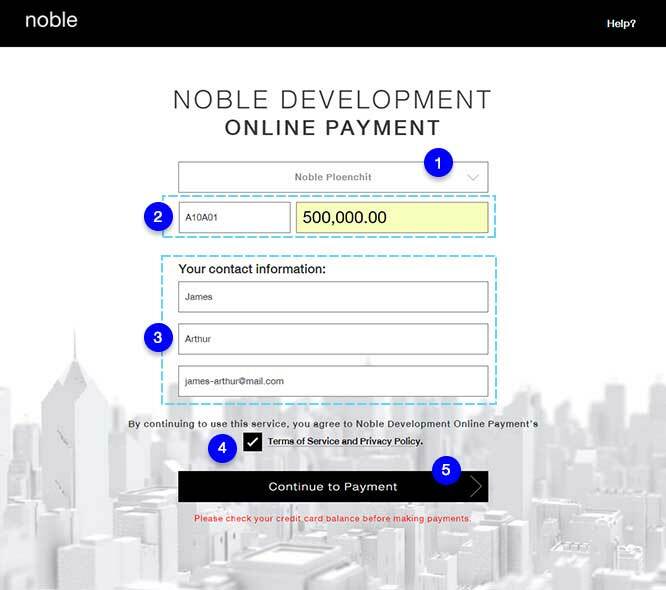 Noble Development Public Co., Ltd. and Continental City Co., Ltd. hereinafter referred to as (“Noble”) provide an online platform “NOBLE ONLINE PAYMENT” hereinafter referred to as (“Website”) to support e-commerce business and users are subject to these Terms and Conditions. 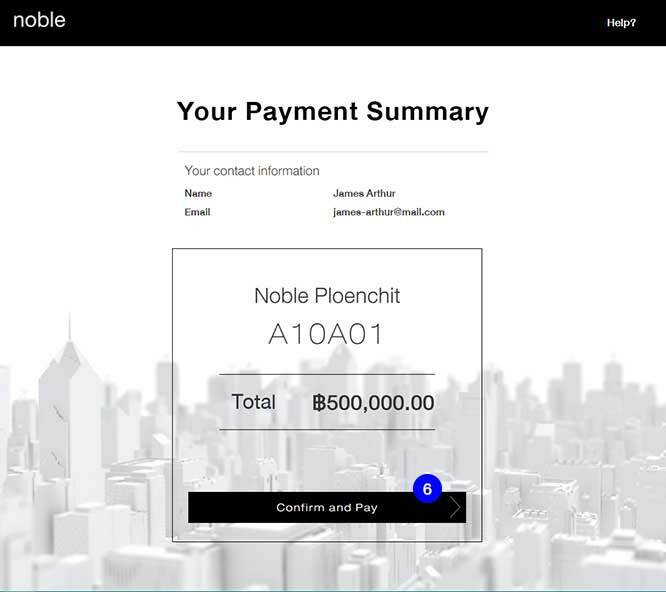 The users should thoroughly study the terms and conditions of this agreement and/or any other Terms and Conditions informed by Noble on the Website, prior to accessing the Website. By using this Website or accessing any pages thereof you agree to be legally bound by these Terms and Conditions. If you do not agree to these Terms of Service, do not access and/or use this Website. 2.1 Noble reserves the right only for service users providing personal information that is accurate, complete and true to be able to conduct e-commerce business. 2.2 Users agree to be fully and completely liable for any damage caused to any other user(s). 2.3 Parent or legal guardian consent is required for every financial transactions for online member under the age of 18. 2.4 All payments shall not be refundable under any circumstances. 2.5 Users are responsible to provide genuine, accurate, and complete information to conduct e-commerce business. 2.6 Users are responsible for service charges and fees of 2.5% of the total payment. 2.7.2 Any activity via the account of the user that is unlawful or contrary to the public order and morality or any reasonable cause to believe that users may access the Website with an intent to commit fraud. 3.1 Users acknowledge and agree explicitly that while Noble will review the content and consistency on a regular basis, however Noble cannot guarantee the up to date, accuracy or completeness of some content or data on the Website. Noble will not be held liable either directly or indirectly for any damage caused by such matter. 3.2 Service System: Users acknowledge and agree explicitly that Noble cannot guarantee a problem-free, uninterrupted and secure usage or access to some parts and/or the Website or any possible damage to user’s computer or any other equipment. Links to other websites which are not managed by Noble, Noble cannot be held responsible for any content displayed on these websites or any damages arising from visiting those websites. 6.1 Noble has the right to modify or terminate the Terms of Service and/or the Terms and Conditions on this Website without prior notice. 6.2 Users agree and acknowledge that trademark, concept, presentation styles and the software developed for providing service on this Website shall be protected by the Intellectual Property Laws. Do not make any copy, whether in part or in whole. 6.3 All content as shown in the Website is subject to copyright law, in which Noble is the owner of Intellectual Property and the user can use such content for using the Website only. The user is not permitted to copy such content for any other purposes. 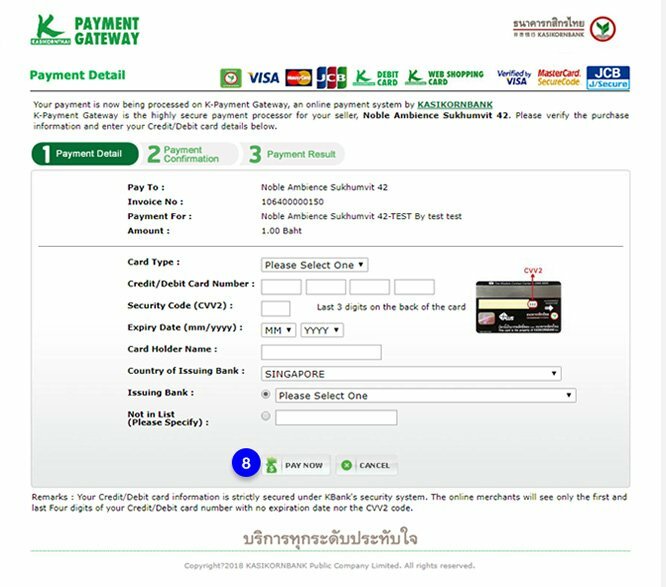 The Terms of Service and/or the Terms and Conditions on this Website shall be governed by and construed in accordance with the laws of the Kingdom of Thailand, without respect to its conflict of laws principles. Our Support Team is always here to assist you. 2. Enter your unit number and total amount. 3. Enter your contact information. 5. Click “Continue to Payment”. 6. 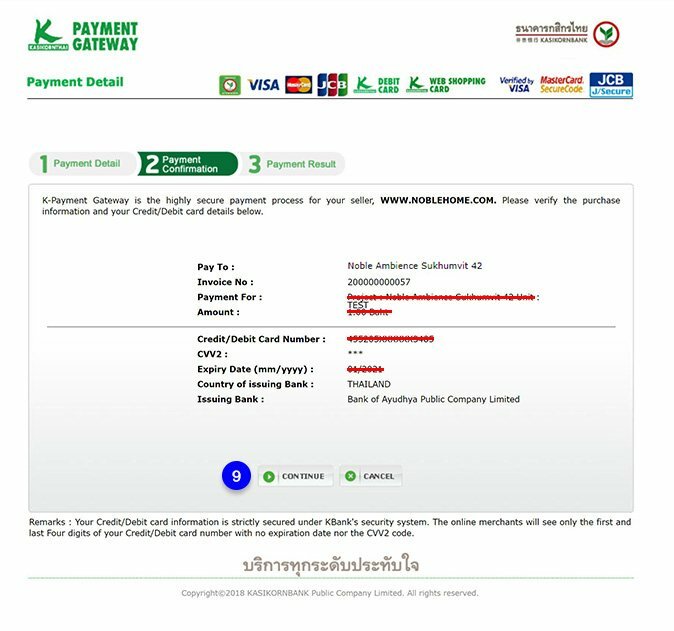 Check your payment summary and contact information before proceeding and Click “Confirm and Pay”. 7. 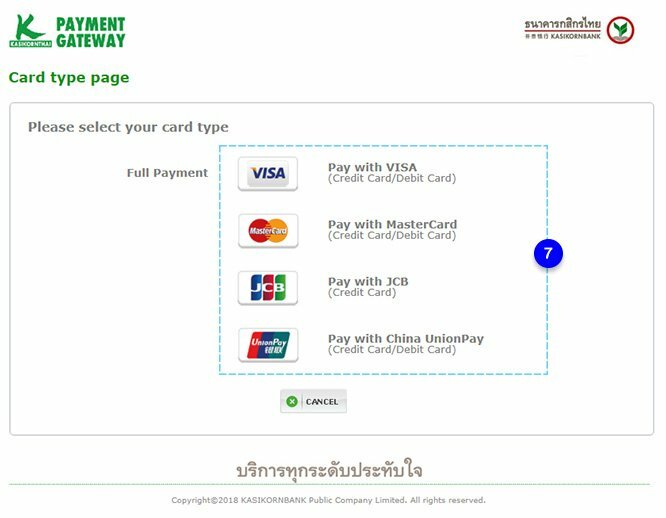 From the available card types listed, select the credit card type and proceed. 8. 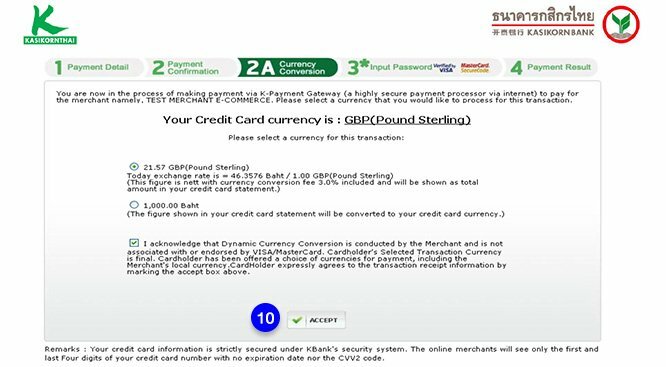 Verify the purchase information and enter your credit card details. Click “pay now”. 9. 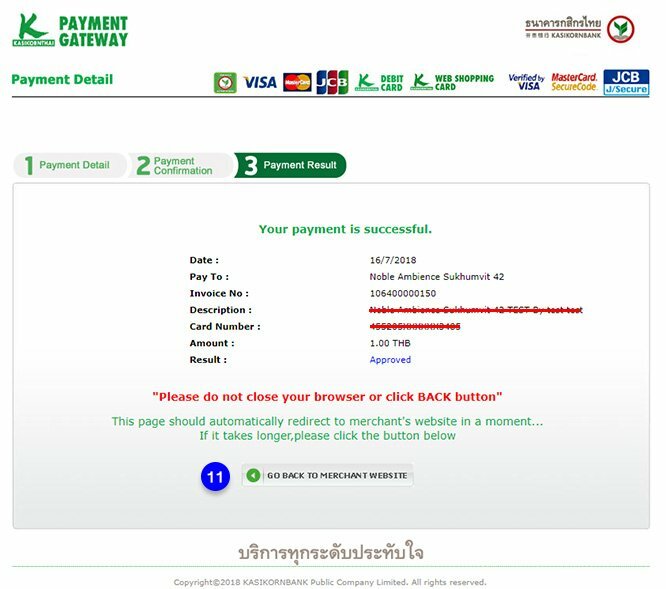 Verify the payment confirmation and click “continue” to make your payment. 10. Please select a currency for this transaction and proceed. 11. Once the payment is successful, you will receive a confirmation email with your payment details.